Get all the track and field fun from the comfort of your sofa. What is the Doha Diamond League? The Diamond League is an exciting fourteen-leg series of track and field meetings. This is the ninth year with the 2018 Diamond League set to kick off in Doha at the Qatar Sports Club. This will be the second year to feature the new championship style system where the top eight athletes at each meeting are awarded points. These only determine who qualifies for the finals in Brussels and Zürich. The first Diamond League meeting, in Doha, will take place on May 4 at 6pm Qatar time - that's 4pm BST, 11am ET, 8am PT and 1am Saturday morning down under. May 4 will see the first Diamond League event of the season kick-off from Doha at the Qatar Sports Club. This is the ninth Diamond League year for athletes and so far the United States have come up with the most success. This is also the second year of the new scoring system which means it could be anybody's for the winning. The idea behind this league was to enhance the worldwide appeal of the old Golden League by going outside of Europe for the first time. That means new countries like China, Qatar, Morocco and the United States were added when founded back in 2010, making it a truly international set of meets. The Doha event is expected to offer some epic men's javelin and women's pole vault events with a stunning list of world class entrants. 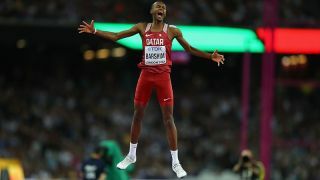 The main event should be opened by Qatar's own high jump legend - world champion Mutaz Barshim - looking for a new record. So if you want to catch all the action, you need to find the best way to watch, which is what we've worked out for you below. Enjoy. Catching world-class athletics is pretty easy in certain countries like the UK and the US, but it hasn't always been so simple in other countries. Luckily, the growing popularity of VPNs have helped in that department. If you don't have easy access to watch the Doha Diamond League where you live, the best way to live stream is to download and install a VPN - that let's you alter your IP address to a country where it is streaming. For US residents the Doha Diamond League will all be available to watch on NBC, NBCSN or the Olympic Channel from 11am ET, 8am PT. This is ideal as you can watch this over your internet connection via NBC.com with a gold pass, meaning it can be enjoyed on many devices from wherever you are. The catch? This is for US only customers and you will be required to enter your cable details to get involved. If you don't have any, you'll have to figure out another way to watch. UK residents will be able to enjoy all the action from Eurosport, with coverage starting at 2pm BST. That means you have a few options as this is broadcast via a Sky, Virgin Media or BT subscription. If you don't have any of those then you can subscribe to the Eurosport Player and enjoy everything via an app on your smartphone, tablet or computer. You can get a monthly or annual pass, or even a free trial for which is available here if your interest starts and ends with the Doha athletics meeting. For Canadians watching the event it's relatively easy as the entire Doha Diamond League will be aired by CBC from 11am EDT The channel will also be live streaming them so if you need to access to any events via the internet, you have that option as well. Australians with Eurosport, you're in luck. The sports channel will be covering the Doha Diamond League event from 1:10am. This is available through the Eurosport app with a subscription that means you can watch it from plenty of devices anywhere with a good enough data connection.